Mr. Stevens never saw it coming. It was raining rather hard for the first time this spring – the familiar nighttime thunderstorm knocked the power out. Then he heard something unsettling coming from the basement… the sound of water pouring in through the basement window. The problem was the gutter above that window. It was clogged which prevented the water from flowing off of the roof, into the gutter, down the downspout and away from the foundation. Unfortunately and alternatively, the rain water overflowed from this gutter directly into the window below which resulted in a flooded basement. Installing gutter guards from GutterSupply.com would have been the preventative, worry-free solution. 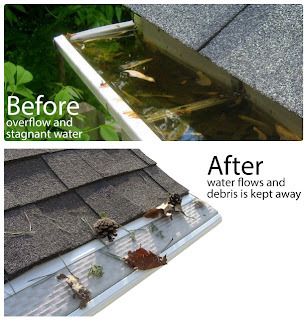 Gutter guards keep leaves and other natural debris from piling up in the gutter and blocking the outlet, allowing water to flow down and away from your home’s foundation. With many different styles of gutter guards to choose from, GutterSupply.com has the right product to fit your gutter needs. Tis the season! Many styles of Gutter Guards are on sale for the months of March and April! For more information on gutter guard products, styles, and installation, please visit our website or call us at (888) 909-7246. > Next post: Winter is over, installing Snow Guards should happen now!